Ontario Conservation Officers Association | The Ontario Conservation Officers Association is a non-profit, and fraternal Association of active and retired Ontario Conservation Officers and other natural resources law enforcement officers. Visit our new Conservation Officer History page, with an Historical Images Gallery, Deceased Conservation Officer information list and more. The Ministry of Natural Resources and Forestry has a web map application that you can use to make a custom map of any part of Ontario. 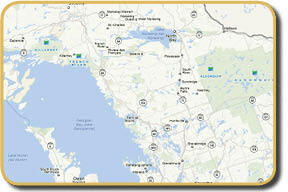 Visit the Land Information Ontario “Make a Topographic Map” site. Directions to Ontario’s lakes and waterways from anywhere in North America. Lake depth contours for more than 300 lakes. Ontario Conservation Officers find at least 10,000 offences every year, but they still need your help. Please report suspicious activity. We hope that both members and non-members alike find this site of use and interest, and that you enjoy browsing through it.